I think I should call my blog Diabetic Good Baking. I love cakes and when I was diagnosed with diabetes I was terrified that I won’t be able to enjoy my Sunday cake treat with cup of coffee. Luckily reality is not that bad J There are many cakes that are suitable for diabetics and thank to sweeteners you can reduce carbohydrates content a lot. Piece of cake with 5g of carbs sounds great and tastes delicious too. It’s easy to make and if you are fun of coconut you will love this cake! 1. Preheat oven o 170C and line springform tin with baking paper. 2. Whisk the egg whites to form soft peaks. Add the sugar (spoonful at the time) and continue whisking until the mixture forms stiff peaks. 3. In a medium bowl mix coconut, potato starch and baking powder and fold it in gently. 4. Pour the batter into baking tin and bake for about 30 minutes. Turn off the oven and leave the cake there for about an hour. 5. For the chocolate topping mix mascarpone cheese with sweetener, cocoa and yogurt. If it’s too thick add a bit more of yogurt or cream. 6. 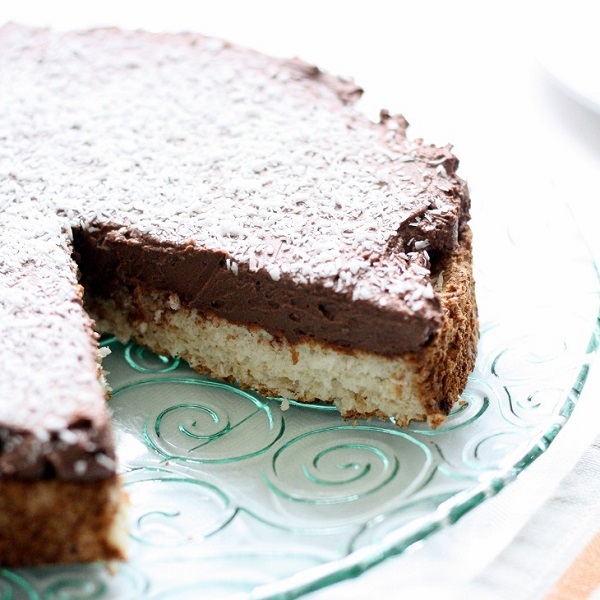 Spread the chocolate cream on top of cooled cake and decorate with coconut. I wonder if you could use tofu in place of the cheese? this sounds like a great low carb recipe! Dixie Im not sure about tofu. Ive eaten it once and it was ages ago. Dont remember the texture or taste. As long as the cheese taste nice when you add sugar or sweetener it should be fine. Im sure that any soft cheese like philadelphia would be great or whipped cream as well. This cake looks amazing! And I really appreciate that you've already calculated the carbs and calories, saves a lot of time! I have to try prepare this cake! :) It looks lovely! I'm assuming "150 desiccated coconut" is 150 grams ? Yes Carolynn.Silly me, hope nobody counted little flakes! This looks delicious! Do you think you could use granulated stevia instead of the splenda? Hello from Sweden! Nice recipe. I love cocos! It looks delish. What size cake tin do you use?